Bob McLaughlin has focused on solving problems for professionals and their insurers for nearly thirty years. Bob’s professional liability practice emphasizes representing insurers of lawyers, architects, engineers, insurance agents and brokers, accounts, and other non-medical professionals. Most of his practice is devoted toward helping firms and their insurers avoid and resolve serious legal malpractice claims. Bob also represents reinsurers of various professional liability and general liability insurers in the United States. 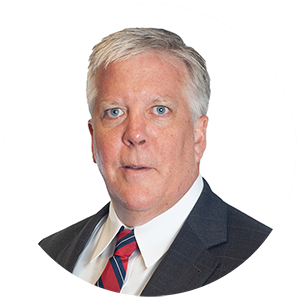 Bob’s experience includes regular trial practice in state and federal courts. He has supervised the defense of legal malpractice litigation on behalf of insurers of several of the 100 largest U.S. law firms on a nationwide basis, including the defense of legal malpractice claims against several top U.S. law firms arising from the Stanford Ponzi scheme, involving a loss to investors of in excess of $5B; multiple cases arising from legal advice to taxpayers on “son of boss” tax shelters and advice regarding shelters under IRS code sections 412(i) and 419; multiple cases involving claims under the Foreign Corrupt Protection Act (FCPA), the Telephone Consumer Protection Act (TCPA), the Fair Debt Collection Protection Act (FDCPA), the Racketeer Influenced and Corrupt Organizations Act (RICO), and other state and federal statutes. Bob also regularly represents insurers of “hard to place” firms, predominantly plaintiffs class action and mass tort firms. He is adept at using creative methods to resolve multiple plaintiff cases. Additionally, Bob represents insurers on cyber liability claims throughout the U.S. He is also active in claims against Tech Media Insurers. Bob’s practice also involves counseling insurers and professionals on litigation management, claim avoidance, and risk management issues. He is an active member of the Professional Liability Underwriters Society (PLUS) and is well versed in trends in the industry, including legal malpractice claims arising from transactional advice, securities advice and opinion letters, claims of deepening insolvency by bankrupt companies, and claims arising from unsuccessful litigation. Bob received his Juris Doctor from Boston College Law School in 1989. 10 Mistakes that Patent Practitioners Make. Authored by Robert E. McLaughlin (April 2007). Presented to the Austin Intellectual Property Lawyers Association. Receiver and Investor Group arising from Stanford Ponzi Scheme (over $5B lost in investments). Lead Insurance Counsel for claim against an AmLaw 100 firm arising from Apple v. Samsung litigation. Lead Insurance Counsel for largest AmLaw 100 patent firm. arising from transactional, securities and litigation work throughout the United States. increased costs to build largest U.S. oil refinery. Lead Insurance Counsel on Engineering firm involved in Flint, Michigan water case. Lead Insurance Counsel on handling tax shelter claims against several of the 100 largest U.S. law firms. Working with large South Florida law firm and insurer to resolve conflict of interest claims arising from representation of now bankrupt client whose officers were complicit in fraud leading to bankruptcy. arising from alleged aggregate settlements. Representing insurers of large Ohio law firm and working in conjunction with defense counsel against claims of “deepening insolvency” brought against firm as the result of bankruptcy of client due to fraud by client. Working with insurers, law firm, and defense counsel to resolve securities class action against former client and account and legal professionals, with law firm settling on a favorable basis. Representing insurers of class action plaintiff firm involving claims arising out of alleged mishandling of thalidomide cases.